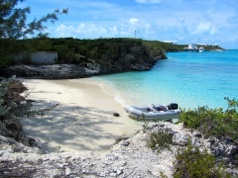 We had a fast motorsail down to Staniel Cay from Shroud and got here in four hours. We anchored at Big Majors and dinghied in to run in some errands. The usually crowded anchorage was fairly empty and most of the boats here are motor vessels. First we brought several weeks worth of garbage to the dump. The picture at the left is where we brought the dinghy and left it on a pretty little beach. Then we walked a block down a road to the town dump. This beach is part of an unfinished restaurant which has been sitting empty since we were here in 2010 and probably even before that. The large two story building appeared to be almost finished when it was abandoned. Even the electrical lines were run. Looking through the windows we saw expensive restaurant supplies piled inside which haven’t moved since three years ago. The dock pictured above was where dinghies could tie up. Even after years and many storms, the dock is still fairly sturdy with a few missing boards and the building is in excellent condition. The windows are in place and no one has broken into it. Probably the owners ran out of money, which happens frequently here. Our next stop was the Batelco office. I needed help putting another month’s data for the iPad on the SIM card, but unfortunately a sign in the store said it was closed after 1 pm on Thursday and also on Friday, opening again next Monday. We proceeded to Isle General where we bought yoghurt, tomatoes, eggs, and mushrooms. The mail boat comes here on Wednesdays but supplies were still fairly good. We also visited the Blue Store to get raisins and more yogurt. However when the lady added up the bill it came to $27 for the yoghurt at $3 each!! Odd, since they were half that price at Isle General. Needless to say, we didn’t buy that yoghurt, and since there was a large amount of it left, I suspect it was incorrectly marked. Our errands over, we returned to the boat. Faithful Daisy got out of her bed to greet us. She hasn’t been feeling well the past few days and we think she has a bladder infection. She has all the signs of it including drinking lots of water and waking up to a wet bed several times. 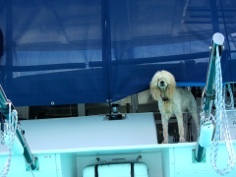 Daisy, who is so completely housebroken that she refuses to “go” on the boat, was probably embarrassed, but one of the signs of a bladder infection is that dogs release urine while sleeping. Luckily we had the exact antibiotic needed to cure the infection which was one of the medicines we purchased from our vet in Stuart before we left last December. She seems to be getting better, but we will still need to bring her for a check-up when we return to the States. 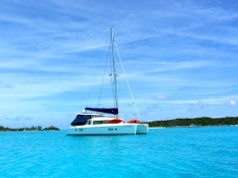 We will probably stay in Staniel Cay for most of the coming week. 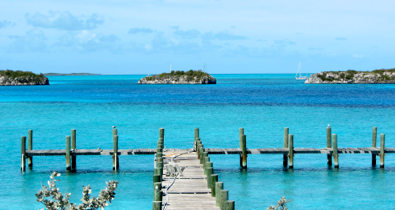 There are predicted squalls and stormy weather on the way, and to get to Eleuthera we have a 30+ mile sail across deep water in the Exuma Sound, so we’ll wait for calm seas and favorable winds. We’ll return to Cambridge Cay to make the crossing. In the meantime we have a lot to do to keep us busy. Mark will be cleaning the bottom and I’ll be cleaning the inside of the boat. Both have been neglected while we have been enjoying ourselves.